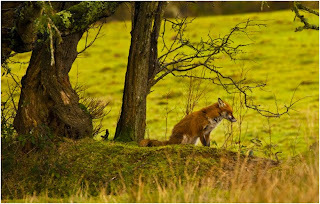 For many years now I have wanted to take photographs of Wild Foxes, although I have plans for the new year to find some, by chance I have come across this one. 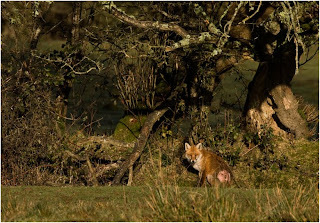 Before this encounter I have only seen foxes at night and in my headlights. 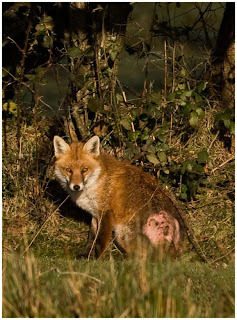 Over the last couple of days I have been following a Fox in West Wales, for obvious reasons I will not disclose where. 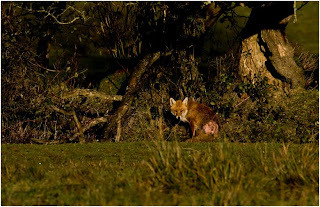 This fox has been seen during the day for the last couple of weeks. It seems to have an old injury. I think it has been hit by a car sometime. However it seems in good health. The images were taken on a Canon 1D MKII n and a 300 2.8 IS lens with 2x converter attached. (This is the only lens that I find that the 2x converter works well with). These were also mounted on a wimberley head attached to a Gitzo tripod. The image at the top of the Blog is a crop of the one below. This was possible as I locked the mirror up and used a shutter release. This makes it possible to take photographs of animals further away and them still being sharp. Try it and let me know how you get on.